Zogby: McCain Up By 1 Point! Sen. John McCain plans to make a stop in Indianapolis on Monday afternoon on the eve of the election. The location is yet to be determined. It is unprecedented to see a Republican candidate for president campaigning in Indiana this late in the election season. It is still my belief that Sen. McCain will carry the Hoosier state next Tuesday. This stop is intended to boost GOP enthusiasm and turnout on Tuesday. The Obama campaign's real goal all along has been to make Indiana close enough that the networks will be unable to call Indiana for McCain at 6:10 p.m. shortly after the polls close. This has happened in every presidential election since 1968. If the networks announce at the beginning of the night that Indiana is too close to call, that will send chills up the spines of Republicans across the nation and energize Democrats in localities where polls are still open. There are rumors that Obama may make yet another stop in Indianapolis on election day. You have my prediction now. Regardless of how well McCain is doing in Indiana, the networks will announce the state is too close to call because that's the Obama line and nobody except FOX News will upset their plans. UPDATE: The event will take place at the airport's international arrivals ramp. Look for details to be added at http://www.johnmccain.com/ later. And here are the details on how to obtain tickets for the Monday afternoon rally. Voter Fraud In Jennings County? Check out this post from Frugal Hoosiers on some chicanery going on down in Jennings County with absentee ballots. The individuals at the center of this controversy aren't known as boy scouts in Democratic circles. In fact, they seem to have as many enemies from within the Democratic Party as they do in the Republican Party. Note that the work of one of these individuals in rounding up questionable absentee ballots two years ago is credited with the Democrats gaining control of the Indiana House. Do We Have This Election All Wrong? No Endorsements From The Star For Local Offices? Am I missing something, or doesn't the Star typically endorse candidates for county offices? I realize most people don't care who their county coroner, treasurer or land surveyor is, but given the past problems we've had in these offices, it would seem the right thing do to help inform the public about who the candidates are in these races and to make a recommendation. Also, the only contested judicial race is for circuit court judge. Again, no endorsement here. Why? Contacted Wednesday, Health Department spokeswoman Janice Okubo cited Hawaii state privacy laws and guidance from the state attorney general in saying she was not permitted to confirm the authenticity of the certificate released by the Obama campaign.But she said it appeared similar to other Hawaii birth certificates. "It looks exactly the same as my own birth certificate," Okubo said. Obama campaign spokesman Ben LaBolt said Wednesday that the document was authentic. The Obama certificate the health department's spokesman is commenting on is a copy purportedly obtained from the department just last year. Nobody questions that it looks like a certificate a person would obtain today for a birth occurring decades ago; however, as document experts have demonstrated, it is a piece of cake to photoshop one of those certificates to make it look real. And that's precisely what some document experts say of the one posted online by the Obama campaign. Hawaii was a state in 1961, when Obama was born. Any person born in the U.S. automatically is a "natural born citizen," said University of California Los Angeles law professor Eugene Volokh. Even if a person is born outside the United States, courts have ruled any child born to at least one U.S. citizen is a U.S. citizen, Volokh said. Stanley Ann Dunham would have counted even if Obama's Kenyan father did not. If this becomes an issue in a post-election eligibility challenge, expect a likely sticking point to be the legal definition in 1961 of how parents could be called U.S. citizens for this purpose, Volokh said. At the time Obama was born, the law stated that a person would be considered a "natural born citizen" if either parent was a citizen who had lived at least 10 years in the U.S., including five years after the age of 14—in other words, 19. Dunham was three months shy of her 19th birthday when Obama was born. But subsequent acts of Congress relaxed the requirement to five years in the U.S., including just two years after the age of 14, meaning Dunham could have been 16 and still qualified even if Obama was born in another country, Volokh said. Congress made the law retroactive to 1952, doubly covering Obama. Any legal challenge would have to argue that Congress can't make someone retroactively a citizen at birth, and prove Obama was born outside of the U.S. after all. Notice that Janega completely obscures the fact that Obama's mother married an Indonesian citizen, Lolo Soetoro, and immigrated to Jakarta, Indonesia when Obama was only six. According to school records there, Obama's name was changed to "Barry Soetoro", Lolo Soetoro was identified as his father, and Obama's citizenship was identified as Indonesian. Even Obama's campaign website acknowledges that Obama was a dual citizen of Kenya until he reached the age of 21 because of his birth father's citizenship. Nowhere in Janega's story does he discuss the impact of dual citizenship on one's natural born status. According to Justice William Blackstone, dual citizenship is incompatible with being a natural born citizen. Natural born has as more to do with one's allegiance and loyalty to the U.S. than it does with where one was born. Nice try, Janega, but your story does nothing to debunk whether Obama is a natural born citizen. This is just another example of sloppy journalism work being passed off to the public as credible investigative journalism work. Janega should have at least attempted to get a lame excuse from the Obama campaign as to why he wouldn't produce the birth certificate he talked about possessing when he wrote his autobiography, "Dreams From My Father", back in 1995. When Obama made a quick trip to visit his ailing grandmother in Hawaii last week, Gov. Linda Lingle quietly ordered Obama's original birth certificate records sealed because of so many efforts by the public to get at them. A lawsuit to open up Obama's records was filed by Obama antagonist Andy Martin just days before Gov. Lingle's department issued that order. Hawaii's health department will release the records only upon Obama's request. Well, we're waiting Sen. Obama. Shame on Janega for refusing to request the most obvious from the Obama campaign and his complicity in the Obama campaign's continued stonewalling on this issue. In the City of Obama, it can't be easy these days as a reporter speaking honestly and openly with your readers and telling them what they don't want to hear: "The emporer has no clothes." But that's exactly what political columnist John Kass brings to his readers at the Chicago Tribune. While even the paper's editors broke with tradition and threw in with The One this year, Kass has remained steadfast and resolute in clinging to the one thing he values most: his journalistic integrity. A former colleague of Kass' at the Tribune, David Axelrod, probably had similar sentiments as a young reporter in the 1980s, but he long ago decided he would rather become a part of the political monster Chicago reporters like Mike Royko loved to challenge in pursuit of money, power and acceptance by the City's elites. Years of political reporting in The Windy City have taught Kass just how bad and evil the people are who run the Chicago political machine. And when he speaks of that machine, his criticism isn't limited to Democrats. He often speaks of The Combine, which is a combination of movers and shakers within both political parties who put their self-serving interests above all else in carrying out their public duties. In putting the tragic triple murders of Jennifer Hudson's mother, brother and 7-year-old nephew into perspective, Kass is having no part of a national news media caught up in Obama mania as they prepare to celebrate a big election night victory in the city next week. "The national media don't care about corruption in Chicago," Kass writes. "It ruins their national narrative of Chicago as the new Camelot." "But indifference is one of the byproducts of systemic corruption. And there is nothing more indifferent than neighbors hearing multiple gunshots and doing nothing." Chicago police officers are suffering terribly low morale. Many cops believe that if they aggressively pursue street crime when the mayor demands it, the Daley administration will abandon them when the neighborhoods push back at election time. It's happened before. Another reason for the spike in homicides was City Hall's decision to dismantle some Chicago public housing projects. Developers loved the idea—they could make fortunes—but Chicago Housing Authority residents were relocated, and some CHA gangsters began clashing with established street gangs in their new precincts. It was in Englewood where Hudson's mother and brother were shot to death before Julian was taken from the home. People heard shots but didn't report them, because they didn't think anything would come of their police calls, and this has given many in the national media an excuse to demonstrate shock and horror at Chicago indifference. But why would residents expect much of anything, when only until recently the alderman whose ward boundaries ran within a block or two of the murder scene was publicly in thrall to Scandalous? There you have it. Police can't employ aggressive community policing because Mayor Daley won't back them up when community leaders push back. Mayor Daley's vaulted public housing initiative did wonders to put money in the pockets of corrupt real estate developer insiders like Tony Rezko, but neighborhoods suffered. And the Chicago political machine relies on street gangs these days instead of the mafia for election day muscle. Yes, the alderman in Jennifer Hudson's Englewood neighborhood, convicted this summer on extortion and tax charges, lived with a leader of the Black Disciples, one of Chicago's most violent street gangs. This is Obama's Chicago. The murder capital of America where in this one-party town the public schools are the worst in the nation and taxes are among the highest in the country. While black on black crime in the city rips apart black neighborhoods, Sen. Obama and his domestic terrorist pal, William Ayers, have advocated against incarcerating teen-age offenders like William Balfour who commit adult-like crimes. As Obama and Ayers pursued their idea of juvenile justice reform in the Illinois General Assembly, a 17-year-old Balfour was taking an SUV owner for a wild ride atop his car that Balfour had just jacked. The owner clung to the car's luggage rack as Balfour sped through city streets, lawns and alleys trying to eject the man. After crashing through a police barricade, Balfour slammed into an electrical pole, bringing down live wires on the owner and sending him to the hospital with bad burns. Under Obama-Ayers' lenient criminal sentencing policies, Balfour was sprung after serving less than 7 years on convictions for attempted murder, carjacking and possession of stolen vehicles. In June, he was picked up by Chicago cops for possession of crack cocaine. Parole officers didn't want to mess with the paperwork of sending him back to already over-crowded jails. In August, his parole officer was turned away from his home. Last Friday, after missing his morning appointment with his parole officer, Balfour explained that he was on the westside babysitting. The parole officer said a child's voice could be heard in the background. Despite an Amber alert that made national news of the 7-year-old missing Julian King after the brutal shootings of his uncle and grandmother, nobody noticed anything out of the ordinary with the white Chevy Suburban described in the nationwide alert parked in a westside neighborhood for three days before a barking dog drew people's attention to the vehicle. Julian's bullet-riddled body was found in the car. So go ahead, Matt Tully, and poke fun at Republicans like me who say Obama's associations with the likes of William Ayers, Rev. Jeremiah Wright, Tony Rezko, Mayor Richard Daley and Rashid Khalidi matter a lot. Unlike John Kass, reporters like Tully care more about what his cocktail and dinner friends will think of what he writes than what he might write to allow his readers to make informed decisions. Suppressing well-established evidence of Obama's close ties to Ayers or withholding a videotape showing Obama honoring Khalidi with his pal Ayers at his side at a dinner in Los Angeles in 2003 as the Los Angeles Times has apparently chosen to do is the road chosen by the typical mainstream reporters of today. The dinner Obama attended with his wife in honor of Khalid was reportedly filled with anti-Semitic, anti-Israel talk. Speaking of those associations, let me pose this question to Matt Tully. How could he spend weeks investigating and writing on Indianapolis' worst public housing project, The Phoenix, for which he won a prize and fail to see a connection between the failed slumlord Tony Rezko and the $100 million in public money Mayor Daley and Sen. Obama helped dole out to Rezko? Did it even cross his mind? Perhaps. But that's not what his close friends want to read about. They're all drinking the Obama Kool-Aid so who is Tully to disappoint them. Reality, Matt, is not fear-mongering. Sometimes a good reporter just has to tell it like it is, not what he thinks his friends want to hear from him. We could use a few more honest, straight-talking reporters like John Kass, who won't park their journalistic integrity at the door. Independent scientific analysis by a number of leading experts supports the literary detective work of WND columnist Jack Cashill that has led him to conclude unrepentant domestic terrorist William Ayers was the primary author of important sections of Barack Obama's highly acclaimed memoir and editor of the book as a whole. Obama's 1995 book, "Dreams From My Father," won the 2006 Grammy Award for Best Spoken Word Album and drew praise from Time magazine, which called it "the best-written memoir ever produced by an American politician." But since July, Cashill has unveiled in a dozen columns, summarized here, his compelling evidence that the co-founder of the radical Weather Underground group – dismissed by Obama as "just a guy who lives in my neighborhood" – shaped and refined the book with his exceptional writing skill and radical ideas. The evidence, Cashill says, "severely tests Obama's claim of a superficial relationship with the self-declared 'communist' Ayers. This appears to be a conscious and consequential deception." Cashill points out that in contrast to "Dreams," the Obama writing samples unearthed before 1995 "are pedestrian and uninspired." "There is no precedent for this kind of literary transformation," he writes. "It is as if a high 90s golfer suddenly showed up with his PGA card -- with no known practice rounds in between." Cashill's expert team includes university professors from the U.S. and England in the statistical analysis of authorship, systems engineers, writers and Ph.D. literary analysts. Most, particularly professors at public universities, asked that their names not be revealed. Cashill cautions that the data-driven computer analysis is not foolproof, but all of the four independent tests that have been completed point to the same conclusion, that Ayers was heavily involved in the writing of "Dreams." One analyst, who used his own proprietary software, wrote to Cashill that there is a "strong likelihood" that the author of "Fugitive Days," Ayers' own memoir, ghost-wrote "Dreams From My Father" using recordings of dialog. The analyst said it's also possible Ayers served as a "book doctor," drastically rewriting work Obama already had done. Who's the attorney handling most of this work for the sheriff? It just happens to be Kevin Murray, who just happened to run Anderson's election campaigns in 2002 and 2006. Anderson argues that he needs all of this extra legal assistance, despite the 27 public lawyers already employed to represent city and county agencies, because his department is so large and complex. But sheriffs in other metro areas of similar size -- from Cincinnati to Charlotte -- make do with attorneys already employed by the public. In St. Louis, the sheriff pays all of $20,000 a year for legal advice . . .
Of course, the issue isn't just the money, although that's a substantial justification for public outrage given how tight city and county resources are stretched. Even more disturbing is the fact that Murray, closely associated with Anderson for years, is the chief beneficiary of the payouts. Despite the sheriff's insistence that the public is well served by the firm's legal work -- he contends that Locke Reynolds has saved taxpayers hundreds of thousands of dollars -- Anderson should have realized that appearances are critical, especially in law enforcement . . .
As one of its recommendations last year, the bipartisan Commission on Local Government Reform argued that sheriffs should be appointed rather than elected in Indiana. One reason for that move would be to extract politics as much as possible from what should be a professional position. The outrageous Case of Sheriff Anderson and the Cozy Law Firm now serves as prime evidence in support of that argument. 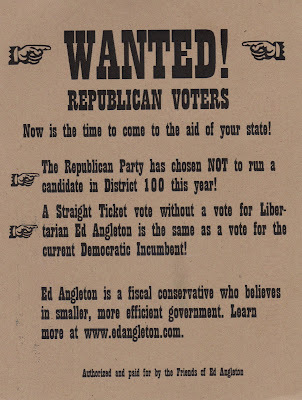 Kudos to District 100 Libertarian candidate Ed Angleton for this targeted direct mail piece to Republican voters in his district reminding them not to just vote a straight Republican ticket but to scratch for him against Rep. John Day (D), who is not facing a Republican challenger. Political consultants charge candidates absurd fees to prepare their direct mail pieces for them. I've often observed how lousy most of the campaign advertising content is that I receive in the mail. Sometimes the simplest of thoughts are the most effective at communicating a message to voters. Will Justice Department Punish Obama Like It Did Stevens? The Bush Justice Department won a conviction against Alaska Sen. Ted Stevens (R) yesterday on seven counts of hiding nearly $250,000 in free home renovations and other gifts from a wealthy oil contractor. Stevens' indictment and conviction in the middle of his re-election bid ensures his defeat. Democrats are celebrating Stevens' conviction, hopeful now of capturing 60 Senate seats in this year's election. Ironically, Democrats have been accusing the Bush administration for the past 8 years of engaging in political prosecutions of Democrats. Let's see, the Justice Department prosecuted Vice Presidential Chief of Staff Scooter Libby, GOP powerhouse lobbyist Jack Abramoff, U.S. Rep. Randy Cunningham, U.S. Robert Ney and U.S. Rep. Rick Renzi. It is currently investigating at least a half dozen other GOP members of Congress. So what about Sen. Barack Obama. After all, his convicted political fixer friend, Tony Rezko, put about $300,000 in his pocket to help him and his wife, Michelle, purchase their South Side mansion. After hearing rumors that Rezko was helping funnel cash to Illinois Gov. Rod Blagoyevich to help with remodeling work on his home, Sen. Obama called on his good buddy Rezko for help. It seemed a co-worker of Michelle's at the University of Chicago Hospital had this beautiful Hyde Park home, but they insisted the buyer purchase the vacant lot next door. Obama couldn't swing the more than $2 million the sellers wanted. So Obama takes Rezko over to the house for a walk through and Rezko comes up with a plan. He had his wife, Rita, purchase the vacant lot at an inflated price of $650,000. If you don't believe me on that, just ask the bank appraiser who lost his job and has filed a whistle blower lawsuit in Cook County Circuit Court accusing Mutual Bank of tossing his lower appraisal in favor of the inflated appraisal and withholding that information from a federal grand jury looking into the transaction. At the same time, the sellers knocked off $300,000 from the selling price of the home for the Obamas, who received a discounted jumbo mortgage to purchase the home for $1.6 million. Later, Rezko improved the lot with a privacy fence and sold a portion of the lot to the Obamas, thereby rendering the balance of the lot worth significantly less than the original purchase price on it. You can shake that up in a brown paper bag however you like, but when you open it up, it is still a shady land deal designed to personally enrich the Obamas. Where's the Justice Department? Let's see an indictment of Obama now so the voters will know that Obama is just a typical Chicago politician on the take. This deal is no different than the set of transactions for which you just prosecuted Sen. Stevens. If it's fair to indict and convict Stevens in the middle of his re-election, then it's fair to indict Sen. Obama. After dealing with the most incompetent, unqualified coroner in the history of Marion County for the past four years, Marion County voters have an opportunity to select one of the most qualified and competent candidates in the country to hold that position. Republicans have nominated Dr. John Pless. Pless is a board-certified forensic pathologist with more than 35 years experience in the field. Not only did he head up the forensic pathology division at Indiana University School of Medicine for many years where he was in charge of performing autopsies for the Marion County Coroner's Office, he has also been an elected coroner in the past in Lawrence and Monroe Counties. Now contrast Pless with the Democratic candidate. "[Dr. Frank] Lloyd is a general surgeon whose parents were involved in politics and who agreed to run for the office after friends approached him when the incumbent dropped out of the race," the Star's Brendan O'Shaughnessy writes. Note that he "agreed to run". The truth is that Lloyd was only asked to run for the office because the color of his skin is black. You see, the Marion County Democrats have implemented an affirmative action program which dictates that only blacks may hold certain offices in Marion County. The coroner's office is one of those offices. That's why Democrats shoved aside the imminently more qualified, long-time deputy coroner John Linehan four years ago in favor of a chiropractor, Dr. Kenneth Ackles. Before the end of his first year in office, Ackles fired Linehan because of his race and hired a less-qualified black deputy coroner, Alfarena Ballew, for the job. Linehan brought an EEOC charge against Ackles and won a favorable determination from a EEOC administrative law judge, who awarded him $400,000. Linehan is also suing Ackles and his chief deputy for defamation for falsely accusing him of ghost employment. The story gets better. Linehan announced he would challenge Ackles at the Democrat's slating this year. In order to be a candidate at slating, you are required to tender to the party a slating fee equal to 10% of your salary. Linehan tendered the fee, but the party rejected it as insufficient, thereby allowing Ackles to be re-slated without opposition. One week later, Ackles dropped out of the race and party leaders met behind closed doors and chose Lloyd over Linehan. For his part, Ackles couldn't even pass a state-mandated training class for county coroners and their deputies. As a consequence, the City-County Council has withheld his pay for months in accordance with state law. Ackles refused to even show up and answer questions about his failure to pass the state exam. Ackles is now suing the county for his pay. Make the right decision, Marion County voters. We need Dr. John Pless now more than ever to restore professionalism and competence to the Marion County Coroner's Office. When I used to work for the Illinois legislature, we had an old saying in state government: "F _ _ _ up and move up." Proving the truth of that old adage, IU officials have announced they are naming Fred Glass as the school's next athletic director. Glass, an attorney by trade, is the genius who negotiated the most one-sided stadium deal in NFL history between the City of Indianapolis and Colts owner Jim Irsay. The deal gave away so much to Irsay that the Capital Improvement Board is now confronting a $20 million a year shortfall in operating capital to maintain and operate a stadium the Colts get to use rent-free. I had the same reaction to Glass' hiring as I did when the NCAA announced it was hiring former IU President Myles Brand to head up the organization. After all, he did such an adept job in handling the firing of former IU basketball coach Bobby Knight. Right? Those of us who fought hard for property tax reform know too well that our efforts will be lost if we are not successful in implementing a constitutional amendment to permanently limit homeowners' property taxes to one percent of the property's assessed value. Past legislative efforts to reduce property tax burdens statutorily have always been eroded by subsequent legislative enactments. In Indianapolis, we have three extremely close legislative races which will determine control of the House. If the Democrats sweep these three races, they will control the House and the property tax cap amendment is as good as dead. The three legislative districts in play are: District 86 between Republican Adam Nelson and Ed DeLaney; District 89 between Republican Chris Swatts and Democrat John Barnes; and District 97 between Republican Jon Elrod and Democrat Mary Ann Sullivan. Each of the Republican candidates are outspoken proponents of the property tax cap amendment. Each of the Democrats are opposed to the permanent property tax cap because they are in bed with the Indiana State Teachers Association, which has contributed tens of thousands dollars to their campaigns through its political action committee. ISTA will use all of its clout to defeat the property tax cap amendment and you can bet House Speaker Pat Bauer will have the full cooperation of DeLaney, Barnes and Sullivan should they win their respective House seats. The same will be true for the stadium bailout for Indianapolis' Capital Improvement Board. DeLaney, Barnes and Sullivan all support the bailout. DeLaney and his wife, Ann, are good friends of Fred Glass, the architect of the disastrous lease agreement with the Colts. Sullivan's husband is an executive with Shiel-Sexton, which has millions of dollars in contracts with the CIB for work on the stadium and the convention center expansion. She's looking out for number one. Barnes' has refused to publicly take a position against the bailout, which is tantamount to supporting a bailout. Nelson, Swatts and Elrod have all made a public commitment to oppose a bailout. If you don't want more public subsidies for the billionaire Colts owner Jim Irsay, then support Nelson, Swatts and Elrod. Instead of using the free services of Indianapolis' corporation counsel, Sheriff Frank Anderson gives all of his legal work to a political crony and former campaign manager, Kevin Murray, of the law firm of Locke Reynolds. According to the Star's Brendan O'Shaughnessy, Murray has billed the sheriff's department more than $3 million since 2003 and could bill the county an additional $1.5 million before his latest contract expires. O'Shaughnessy notes that the corporation counsel's office employs 27 lawyers at salaries from $45,000 to $90,000. Sheriff Jack Cottey also used outside counsel, but the fees were capped at $290,000 per year. It should also be pointed out that the corporation counsel's office still farms out some of its legal work to local law firms. Some have questioned where that work is currently being steered. Attorney Paul Ogden has more on that here. At the time of the adoption of the Constitution in 1787, no potential candidate could meet the "natural born" requirement because the new country had only recently freed itself from British rule. Although many revolutionaries were born in the U.S., they had been born as subjects of the King of England. To address this situation, the founders allowed persons who were citizens at the time of the adoption of the Constitution and who had resided in the U.S. for at least 14 years to run for president. An early constitutional scholar, Joseph Story explained its need in 1833: "It was doubtless introduced (for it has now become by lapse of time merely nominal, and will soon become wholly extinct) out of respect to those distinguished revolutionary patriots, who were born in a foreign land, and yet had entitled themselves to high honours in their adopted country." Every president since Martin van Buren has been considered a "natural born" citizen; however, candidates have faced scrutiny concerning the constitutional qualification from time to time. In 1964, Barry Goldwater was confronted with the fact that he was born in the Arizona territory before it became a part of the United States. In 1968, Michigan Gov. George Romney was challenged because he was born in Mexico after his U.S. citizen parents had fled across the border when Mormons were being prosecuted in the U.S. for polygamy. And just earlier this year, the New York Times raised questions about Sen. John McCain's "natural born" status because he was born in the Panama Canal Zone while his father was serving duty for the U.S. Navy. Despite media scrutiny of these other presidential candidates, all Republicans I might add, Sen. Barack Obama has escaped complete scrutiny on the issue despite many unanswered questions surrounding his birth and early years which cast doubt on his "natural born" status. But the general propriety of the exclusion of foreigners, in common cases, will scarcely be doubted by any sound statesman. It cuts off all chances for ambitious foreigners, who might otherwise be intriguing for the office; and interposes a barrier against those corrupt interferences of foreign governments in executive elections, which have inflicted the most serious evils upon the elective monarchies of Europe. Germany, Poland, and even the pontificate of Rome, are sad, but instructive examples of the enduring mischiefs arising from this source. In the case of Sen. Barack Obama, it is generally accepted at this point that he was born to a U.S. citizen mother, Stanley Ann Dunham, and a Kenyan citizen father, Barack Hussein Obama. At the time of his birth, the laws of both countries would have permitted him to hold dual citizenship. Because Kenya at the time of his birth was also a part of the British Commonwealth, Obama would have also been considered a B.C. citizen. According to a birth certificate produced by Obama's presidential campaign, he was born in Honolulu, Hawaii on August 4, 1961. Obama's campaign website says Obama's Kenyan citizenship expired on August 4, 1982 because he neither renounced his U.S. citizenship nor swore an oath of allegiance to Kenya before his 21st birthday as required by that nation's laws. Almost as quickly as Obama's birth certificate was posted, experts who reviewed it concluded it was a bad forgery. Unlike Sen. John McCain, Obama did not produce the original, long version of his birth certificate which would have been given to his mother upon his birth. Instead, his campaign produced a purported certified copy which was obtained from the Hawaii Department of Health just last year. An expansive analysis of this document can be found here, which gives serious reason to doubt its validity. It is difficult to understand why the Obama campaign has not put this issue to rest by simply putting out Obama's original birth certificate for public review. According to his autobiography, he had this document at the time his book was released in 1995. "Ironically, Obama mentions his birth certificate in passing on Page 26 of his 1995 memoir, “Dreams of My Father,” writes blogger Jeff Schreiber. “I discovered this article, folded away among my birth certificate and old vaccination forms, when I was in high school,” he wrote. Adding more to the mystery is a claim by a former Pennsylvania Deputy Attorney General, Philip J. Berg, that he has been in communication with Obama's paternal grandmother in Kenya and, according to Berg, she claims she was present for Obama's birth at a hospital in Kenya. Berg claims to have a recording of the conversation, but he has not released it to the public as of this writing. Berg also initiated a lawsuit against Obama alleging he is not a "natural born" citizen in the federal district court for the Eastern District of Pennsylvania. Judge R. Barclay Surrick dismissed Berg's lawsuit on Friday on the ground that Berg lacks standing to bring the suit. There are no fewer than eight similar lawsuits pending in other states as of this writing on the same subject matter. The complications over Obama's birth do not end with the issue of his Kenyan citizenship. Last year, an AP reporter obtained a record from a school Obama attended in Indonesia during the late 1960s, which has created quite a stir in the blogosphere, although it has been virtually ignored by the mainstream media. The school record indicates that Obama's legal name was "Barry Soetoro", that his father was Lolo Soetoro, that his citizenship was Indonesian and that his religion was Islam. Obama's birth father abandoned him when he was two. His parents were divorced, and his mother later married Lolo Soetoro and immigrated with her son, Barack Obama, Jr., to Indonesia. The school record obtained by the AP reporter suggests Obama was adopted by his step-father, which automatically made him an Indonesian citizen. Oddly, news reports which ran in the U.S. based on the Indonesian school record completely omitted the fact that Obama's name had been changed and his citizenship listed as Indonesian. The Indonesian citizenship issue further complicates Obama's U.S. citizenship status if he was born in Kenya. Under the U.S. Immigration and Naturalization Act in effect at the time of Obama's birth, he could have become a U.S. citizen upon his birth even if he was born in Kenya because his mother was a U.S. citizen; however, because his mother did not remain in the U.S. for the period of time required of her for her son to obtain citizenship, he would have lost his citizenship status if he was actually born in Kenya. Further, if he became an Indonesian citizen, dual citizenship would have been permissible under U.S. law (although not Indonesian law at that time); however, dual citizenship is not compatible with the "natural born" requirement in the Constitution based upon Justice William Blackstone's analysis. People need to be careful not to confuse Obama's "natural born" status with his status as U.S. citizen. These are two entirely different propositions. He could be a citizen by virtue of his birth in the U.S., birth abroad to a U.S. citizen or through the naturalized citizenship process set out in our Immigration and Nationality Act. Being a citizen does not mean you are a "natural born" citizen. Being someone born in the U.S. may also not make you a "natural born" citizen. By way of example, I recently was contacted by a Saudi citizen for immigration assistance with her family. She was born in San Diego, California while her father and mother were residing there temporarily because of her father's work. Her parents returned with her to Saudi Arabia where she grew up and became a Saudi citizen. In her late 20s, she attempted to get a visa from the U.S. consulate in Riyadh. What she learned shocked her. The consulate told her she didn't need a visa but a U.S. passport because she was considered a U.S. citizen based on her birth in San Diego. According to the analysis of some scholars, she would meet the "natural born" requirement while Sen. McCain would not because he was born in the Panama Canal Zone while his father was serving in the Navy. I cannot imagine the framers of our Constitution intended such a ridiculous outcome with this requirement. Again, the focus should be on one's loyalty and allegiance to country, not the place of their birth, if its purpose is to prevent foreign interference. Some might wonder how Obama's situation could possibly pose any of the mischief the founders feared in interposing this requirement. For one, because Obama denies he was either born in Kenya or became an Indonesian citizen, he could be subject to blackmail in the event the leaders of either country know otherwise based upon their government's records. Both countries harbor radical Muslims who are hell-bent on destroying the U.S. In addition, you can bet other foreign intelligence agencies have researched this issue thoroughly and could also be prepared to use it to undermine confidence in our nation's leader should Obama become president. Rumors persist that Obama may have used an Indonesian passport to travel to Pakistan while he was in college because travel by U.S. citizens into Pakistan at that time was nearly impossible. Imagine the impact this would have on Obama's credibility and the embarrassment our country would face if such a basic constitutional requirement of holding our highest office was overlooked by our political system. I fully acknowledge the fact that there is no agreement among constitutional scholars on what the term "natural born" means in Article II. In the case of Sen. McCain, respected constitutional scholars like Professor Lawrence Tribe believe McCain satisfies the requirement, but others aren't so sure. “There are powerful arguments that Senator McCain or anyone else in this position is constitutionally qualified, but there is certainly no precedent,” said Sarah H. Duggin, an associate professor of law at Catholic University who has studied the issue extensively. “It is not a slam-dunk situation.” Earlier this year, the U.S. Senate unanimously approved a non-binding resolution deeming McCain a natural born citizen based on both of his parents being U.S. citizens and his father's service in the military at the time. Obama's situation was not similarly taken under consideration by the U.S. Senate because the circumstances surrounding his birth have slowly come to light. Typically, presidential candidates come from well-established families within their respective home states and much is already known about them by the time they seek the presidency. This is not the case with Obama. His childhood is a riddle rapped up in an enigma. His maternal grandmother has never spoken publicly about such matters and may be physically unable to at this point and both of his parents are dead. There aren't childhood acquaintances or even college acquaintances who can vouch for Obama. We don't know a lot about him, and we need to know much more before we cast the final vote a week from Tuesday. Sadly, it does not appear the American people will be afforded that opportunity before election day. Is Jennifer Hudson Family's Tragedy The Consequence Of Obama-Ayers Policies? As a state senator, Sen. Barack Obama supported juvenile justice reforms advocated by his neighbor, friend and political supporter, William Ayers, who bombed the Pentagon, U.S. Capitol, a New York police station and a New York judge's home during the late 1960s as a Weather Underground member. Obama and Ayers believe it is wrong to lock up teen-age juveniles who commit violent crimes for long periods of time. Obama and Ayers wanted to keep as many juvenile offenders out of adult court as possible. So-called "blended sentencing" allows juveniles to be released early, if they keep their noses clean, and avoid tougher adult sentencing, giving them a second chance at life. A second chance at life for William Balfour, a 27-year-old Chicagoan, may be responsible for the tragic murders on Friday of Oscar-winning actress Jennifer Hudson's mother and brother. Hudson's 7-year-old nephew has been missing since the killings. According to news reports, the 27-year-old Balfour was paroled in 2005 at the age of 25 after serving only 7 years of his sentence for attempted murder, car jacking and possessing stolen vehicles. That means Balfour was about 17 years old (he was charged in 1998) when he tried to murder someone. I can't account for why Jennifer Hudson's sister would want to marry a guy a short time after he was released from prison for attempted murder, but the fact that he was out on the streets after such a relatively short time in prison presented the opportunity for him to commit even more violent crimes. Hudson's sister became estranged from Balfour in recent months, and he had apparently been making threats to his wife's family. Hudson's sister had recently accused him of stealing a car. In January 1998, a front-page headline in the Defender touted Obama's claim that the juvenile justice bill might be on the verge of failure. Obama hoped that black caucus opposition to the sentencing provisions might be matched by concerns among some Republicans that the bill could force expensive jail construction (based on the prospect that the deterrent effect of blended sentencing might fail, thereby forcing more juveniles into adult prisons). Obama's hopes were wildly off-base. In the end, the juvenile justice bill passed overwhelmingly. Given his ambitions for higher office, Obama was no doubt reluctant to vote against the final bill. A last-minute, minor and uncontroversial adjustment to the blended-sentencing provisions by the governor appears to have provided enough political cover for the bill's sharpest critics including Obama to come around and support it. "Michelle and I were absolutely heartbroken to learn about this unimaginable tragedy, and we want Jennifer to know that she is in our thoughts and prayers during this very difficult time. We also pray for the swift and safe return of her young nephew." It is doubtful Sen. Obama has given any thought to the fact that weakening sentences for juvenile offenders has had consequences in home town of Chicago. Murders in the Windy City are running at near-record levels this year. The South Side from where he hails is a hot bed for violent crimes. And most of the crimes are being committed by young offenders. Ironically, no group of voters in Illinois support Obama more strongly than African-Americans. Yet they are the ones who suffer the most from these violent crimes. Sen. John McCain's hopes in Indiana seem to turn almost entirely on the popularity of Gov. Sarah Palin, his running mate. More than 25,000 packed into the Verizon Wireless Music Center in Noblesville nine days ago. Yesterday, Palin returned to the Hoosier State at a packed rally of more than 10,000 in Fort Wayne's Memorial Coliseum. On Wednesday, Palin will make another Indiana stop in Jeffersonville according to the Louisville Courier-Journal. Ticket information for the Jeffersonville event, which is scheduled to begin at 6:30 p.m. at a warehouse at 100 River Ridge Circle, can be found at http://www.johnmccain.com/. The Concerned Clergy of Indianapolis wants you to support IPS' $278 million bond issue. "Rev. Bruce Patton, a longtime Concerned Clergy member and retired Indianapolis Christian Church (Disciples of Christ) pastor, said defeat of the referendum would be a defeat for schoolchildren," writes the Star's William Booher. "I think it would deter learning," Patton said of the continued deterioration of the old school buildings. "I think it would be a disaster, in my opinion." The bond issue will cost average homeowners hundreds of dollars a year more in property taxes. Contrary to what proponents have been telling the public, the new taxes are on top of the property tax caps signed into law by Gov. Mitch Daniels earlier this year. The ministers' churches, of course, won't be paying for these higher property taxes since they are tax-exempt. It would also be nice if they showed as much interest in support for education reform initiatives which would actually improve the quality of the education the children receive at IPS schools as opposed to spending more on construction projects. If elected, however, he also would be the most inexperienced president in modern American history, only four years removed from service in the Illinois Senate. And experience matters greatly in a president, particularly in the area of foreign affairs. Republican John McCain has a long and distinguished record of service to the nation. His personal sacrifices, including more than five years as a prisoner of war in Vietnam, deserve the gratitude of all Americans. He has been a strong, bipartisan leader in the Senate, pushing, among other issues, for reforms in the campaign finance system and pork barrel spending. Obama supporters had been very confident that the Star would endorse Obama. I'm not surprised by today's outcome. The Star sat down with both Sen. Hillary Clinton and Sen. Barack Obama last spring during Indiana's May primary. I complained at the time that the editors treated Obama with kid gloves during his interview. Nonetheless, the editors made a wise decision in endorsing Clinton over Obama. An interview with former Secretary of State Madeline Albright and Gen. Wesley Clark convinced the editors that Obama's experience deficit was a real problem, particularly in foreign affairs. To my knowledge, McCain never sat down with the Star's editorial board. In fact, other than a quick stop in Indianapolis for a fundraiser and appearance before a small group at the Emmis Communications building downtown and his speech before the National Sheriffs Association in July, McCain has made no other stops in Indiana. McCain's decision to ignore Indiana until just recently and Obama's decision to put such intense focus on the state leaves us where we are today: a tossup state. U.S. District Judge R. Barclay Surrick has shielded Sen. Barack Obama from having to answer questions about whether he qualifies as a "natural born" citizen as required of a candidate for president of the United States. Late on Friday Judge Surrick, a Democrat, issued a 34-page decision dismissing a complaint filed by attorney Philip J. Berg in the Eastern District of Pennsylvania for lack of standing on Berg's part. The standing issue was always a big hurdle for Berg. He earlier said he would appeal the case all the way to the U.S. Supreme Court, but with only 10 days remaining before the November election, Berg's chances of success are very remote. I should point out that there are suits pending in eight other states raising similar questions that Berg's lawsuit raised. Ironically, Obama mentions his birth certificate in passing on Page 26 of his 1995 memoir, “Dreams of My Father.” “I discovered this article, folded away among my birth certificate and old vaccination forms, when I was in high school,” he wrote. The birth certificate produced by Obama is not the original long version certificate which would have been issued to his mother at the time of his birth, and which is presumably the birth certificate Obama references in his book. The birth certificate posted by the Obama campaign purports to have been received from the State of Hawaii in June, 2007. Attorney Philip J. Berg claims to have a recorded phone conversation with Obama's paternal grandmother from Kenya, who claims she was present for Obama's birth, which she says occurred in Kenya. Berg said, “I am totally disappointed by Judge Surrick’s decision and, for all citizens of the United States, I am immediately appealing to the U.S. Supreme Court. This is a question of who has standing to uphold our Constitution. If I don’t have standing, if you don’t have standing, if your neighbor doesn’t have standing to question the eligibility of an individual to be President of the United States - the Commander-in-Chief, the most powerful person in the world - then who does? So, anyone can just claim to be eligible for congress or the presidency without having their legal status, age or citizenship questioned. According to Judge Surrick, we the people have no right to police the eligibility requirements under the U.S. Constitution. According to the Secretary of State's office, 221,099 Indiana voters had cast early votes as of Thursday. The Star's Jason Thomas reports that 260,550 absentee ballots were cast in the 2004 election. Troubling for Republicans are the number of early voters in Marion and Lake Counties where the early vote totals already exceed the 2004 mark. In Marion County, more than 42,230 voters have cast their ballots as of Friday. In 2004, about 27,000 votes were cast by absentee ballots. In Lake County, more than 13,000 early votes have been cast, compared to the 12,683 absentee ballots cast four years. Both Marion and Lake Counties will favor Sen. Barack Obama heavily over Sen. John McCain. In the counties surrounding Marion County, which tend to favor the Republican candidate heavily, the following number of early voters has been reported to date: Hamilton (6,345); Hendricks (5,500); Hancock (2,466); Johnson (2,000); and Boone (1,500). The Pennsylvania Democrat who has sued Sen. Barack Obama demanding he prove his American citizenship – and therefore qualification to run for president – has confirmed he has a recording of a telephone call from the senator's paternal grandmother confirming his birth in Kenya. The issue of Obama's birthplace, which he states is Honolulu in 1961, has been raised enough times that his campaign website has posted an image purporting to be of his "Certification of Live Birth" from Hawaii. "This has been a real sham he's pulled off for the last 20 months," Berg told Savage. "I'll release it [the tape] in a day or two, affidavits from her talking to a certain person. I heard the tape. She was speaking [to someone] here in the United States." He said the telephone call was from Obama's paternal grandmother affirming she "was in the delivery room in Kenya when he was born Aug. 4, 1961." Berg said he's pursuing the issue because of "the most important document in the United States," the U.S. Constitution. "Nothing is more important than enforcing the Constitution," he said. "The Constitution's provisions are very small for qualifying for president. One, be over 35, and he is. Two, be in the country 14 years, and he has been. Three, be a natural-born citizen. He is not." If Berg's claims are true, it could pose a major constitutional crisis in the event Sen. Barack Obama is elected president a week from next Tuesday. This new development may also help explain why Sen. Obama suddenly rushed back to Hawaii to visit his elderly maternal grandmother in Honolulu, who was released from the hospital for a hip injury more than a week ago. Berg is seeking a summary judgment in his federal court action against Obama based on the fact that the defendants failed to answer his Request for Admissions within thirty (30) days pursuant to Rule 36 of the Federal Rules of Trial Procedure; however, the Defendants have filed a motion to dismiss Berg's case. Typically, discovery in federal cases does not begin until after the party's have held their first case management status conference, which has not occurred in Berg's case. Obama's alleged birth in Kenya is only part of his problem. School records from Indonesia suggest Obama was adopted by his step-father, Lolo Soetoro, that his name was changed to "Barry Soetoro" and that he was an Indonesian citizen. Obama's campaign has acknowledged that he was a citizen of Kenya until he reached the age of 21 by virtue of his father's status as a Kenyan citizen at the time of his birth. If Obama's paternal grandmother's claims are true, it would suggest Obama has held citizenship in at least three countries. Democrats were gloating earlier this week over former GOP mayoral candidate Matt Kelty's pleading guilty to felony campaign finance-related charges. As I noted at the time, there are a lot of candidates playing fast and loose with our campaign finance laws and, if we had a few more tough prosecutors like Dan Sigler, you would see a lot more politicians facing a fate similar to Kelty's. Well, today the National Republican Congressional Committee filed a complaint against 3rd District Democratic congressional candidate Mike Montagano, a young lawyer, for allegedly violating federal campaign finance laws by receiving money from his father in violation of federal contribution limits and for failing to disclose financial assistance from his father as contributions to his campaign. Despite leaving his full-time job at Stuart & Branigan's Indianapolis office in May, 2007 to run full-time for Congress, Montagano managed to purchase a $326,000 home with the help of his father in the Third District according to the complaint. A mortgage was later recorded for the home in the amount of $226,000 showing Montagano and his father as co-signors. His father paid the property taxes on the home according to tax records the report alleges. His father serves as Montagano's campaign treasurer. The complaint notes that the jobless Montagano purchased or leased a $34,000 Hummer H3 and made a loan of $33,500 to his campaign last year. According to the complaint, the financial assistance Montagano received from is father was not disclosed on his FEC reports as contributions and, due to the amount of money involved, the payments from Montagano's father greatly exceeded the per election contributions limits set forth for individuals in the federal law. A big hat tip to Hoosier Access. UPDATE: The Fort Wayne Journal-Gazette has more here. Montagano declined to be interviewed for their story. This Texas woman volunteering for John McCain in Pittsburg found out the hard way what happens when you cross the path of a mugger while visiting an ATM machine with a McCain bumper sticker on your car. 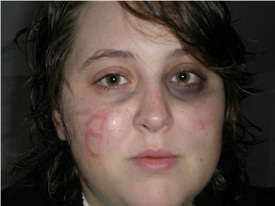 It wasn't enough that her attacker robbed her. He also used a knife to carve the The One's initial "B" on her face. It's happening all across America. People who dare to express their public support for the McCain-Palin ticket are being assaulted or having their property vandalized by Obama's thugs. Is this the future we have to look forward to in America under an Obama presidency? No tolerance for dissenting views? Looks more like The One's cousin Odinga's Kenya than the United States of America where you lose an election, blame the Christians and then go burn their villages. UPDATE: Pittsburg police report that Ashley Todd, the alleged victim, made up her story about being mugged and then branded with the letter "B" by her attacker. She could face criminal charges. Note that this young lady's psychotic behavior does not negate the fact that there have been numerous cases of assaults and vandalism to property conducted across the country by Obama supporters. Note also that Sen. Obama has never apologized to Sen. McCain and Gov. Palin for spreading false rumors that their supporters were chanting "Kill Him", referring to Obama, at McCain-Palin rallies at which the candidates spoke. Was Double Homicide A Hate Crime? More On That "Just A Guy From The Neighborhood"
Indy Home Sales Turn The Corner?